Talk of The Villages Florida / Recreation in The Villages / Golf in The Villages / Golf cart requirements. Hi. I tried to find the requirements for golf carts to be driven in the villages and on the golf courses. I'm a little confused. From what I found it is described as a vehicle with 4 wheels that goes under 20 mph, has light, turn signals, brake light, a windshield and side reflectors. Here is my problem. I'm in the process of restoring an early 70s Harley Davidson 3 wheel golf cart, which I plan on bringing to the villages next Jan, feb and march (rental home). I plan on having all the necessary requirements the villages ask for but the coolest part of this cart is the fact that it only has 3 wheels and a steering bar. Should I stop my project before I get to far along or is it perfectly ok to enjoy this piece of history in the villages next winter. If anyone can clear this matter up for me or point me in the right direction it would be a big help. Hi Paul, I cannot answer your question but I would suggest you call the Sheriffs office and ask them. You Don't state which village your rental home is in so here are the numbers for each county. I will look out for a 3 wheeled Golf Cart next year. Wow!! Thanks for the quick reply. I’ll give them a call and see what I can find out. Thanks again Paul. For the golf course part of you question. 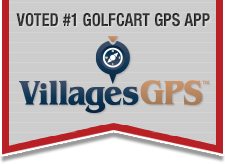 The villages is very picky about tire size, so there is no damage to the golf courses. IMHO, make sure that your three wheeled cart has villages approved golf cart tires. Also, when you talk to the local police, double check what you need to do to have the rebuilt vehicle certified that it can not go faster than 20 mph. One other thing, you should check with local insurance companies (we use progressive) and see if there will be any problems with insurance coverage. Even thought we were insuring a golf cart, progressive issued it as a motorcycle, no idea why. I know for a fact there are only specific tires allowed on the golf courses and depending upon the tires they need to be on all 4 wheels or just the back 2.. Here is the policy and the link to the approved tires. NOTE most 4 wheel carts are not examined for tires before being allowed to use teh TV golf courses...but having something unusual like you propose, i would make certain you are in compliance for people will be looking ! There just so happen to be a story in the Sun Sports section today about a golfer on his way to becoming a pro when he was driving a 3 wheel golf cart back in 1974 and had an accident and was paralyzed for life. This link has info about him, but doesn't mention it was a 3-wheeler, that was in the Sun today but that story is not online yet. It would be fine to use your 3 wheeled cart as long as it has proper tires. Personally I wouldn't use one as they are notorious for flipping over when frightened. On a side note, can you share a photo? I'd love to see it!